British company Tree Tents International has unveiled its most innovative and adaptable glamping structure yet. 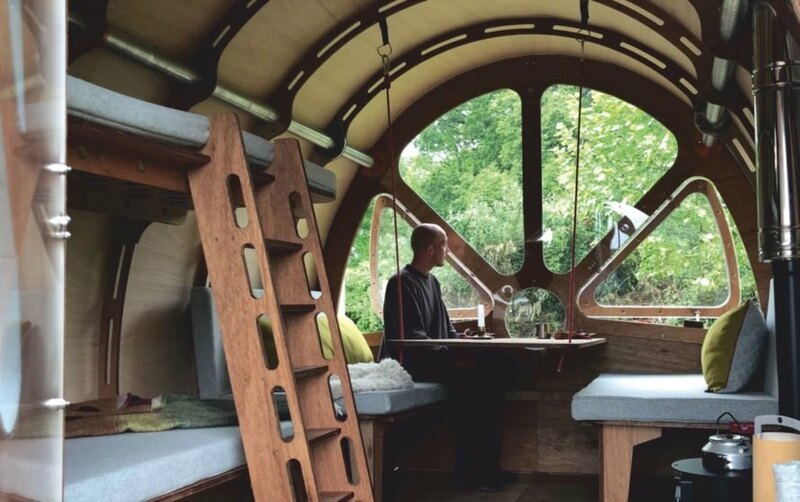 Meet the Fuselage, a flat-pack treehouse that can be set up almost anywhere, even on the most challenging terrain. 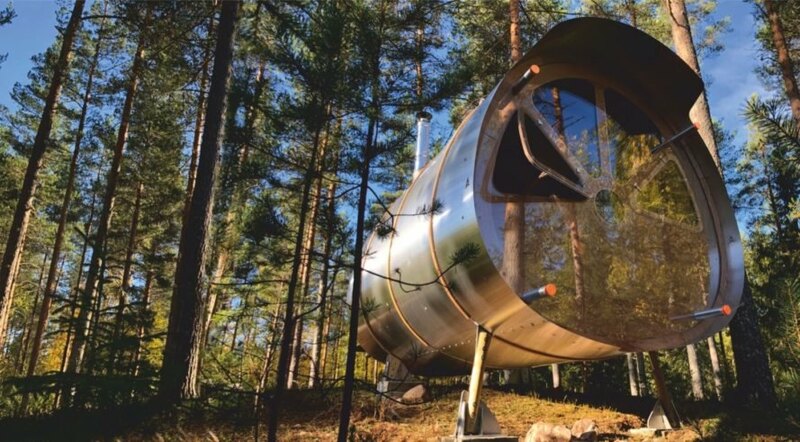 Dubbed by the firm as an “extreme wilderness cabin,” the cylindrical dwelling takes inspiration from modern aerospace design for its durable and lightweight structure. 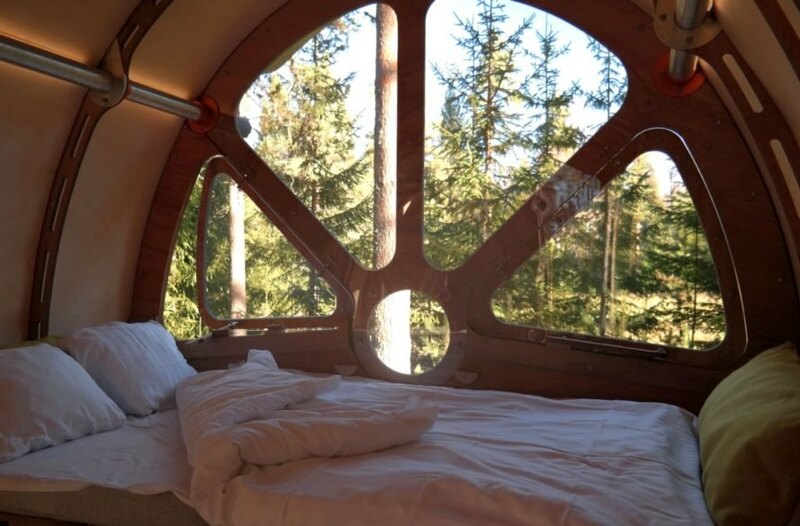 Designed with a triple-layer insulated skin, low-voltage radiant heating and a micro wood stove, the solar-powered Fuselage has been precision-engineered for thermal comfort in a wide variety of climate conditions, including the wintry environment of Northern Sweden, where one of Tree Tents’ first Fuselages was installed just a few hundred miles below the Arctic Circle. 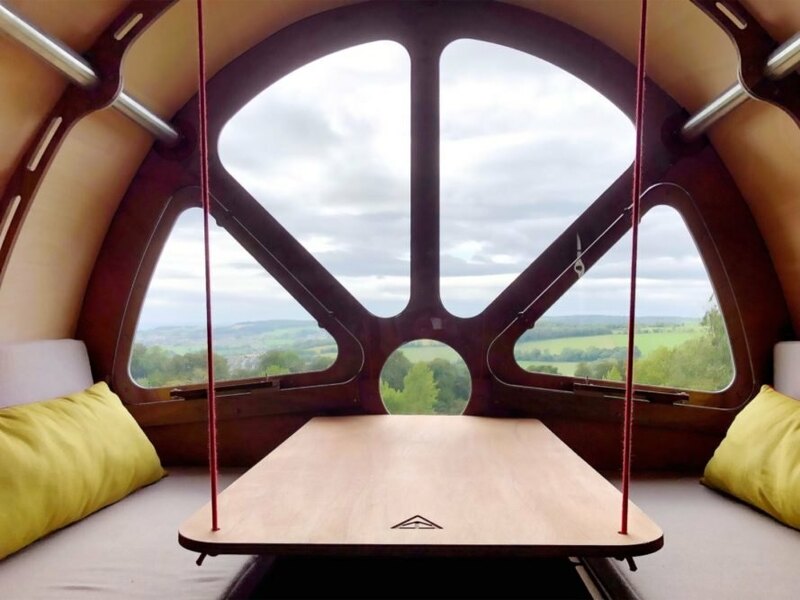 “I designed the Fuselage to access some pretty extreme environments — allowing people to stay in these amazing locations with a structure that is both lightweight in construction but as tough as old boots,” Fuselage designer Jason Thawley said in a press release. To minimize the environmental impact of the Fuselage, the structures are flat-pack and modular so that no heavy machinery is required onsite for installation. Built from sustainably sourced wood and recycled aluminum, the units can be suspended from trees or mounted on stilted feet without need for large foundations. The firm even uses the waste from the manufacturing process to make camping accessories, such as stools and rucksacks, as part of its commitment to sustainable design. Assembled from a kit, the Fuselage features a fully insulated wood-and-aluminum structural frame with an aluminum outer shell. The interior, which measures 3 by 5 meters, includes quality marine ply hardwood flooring and birch liner as well as a lockable entrance door and double-glazed windows. Each bespoke unit also comes with furnishings and can be upgraded with different custom offerings. The base price for Fuselage starts at £26,000 (about $33,672 USD), not including valued-added tax or installation costs. 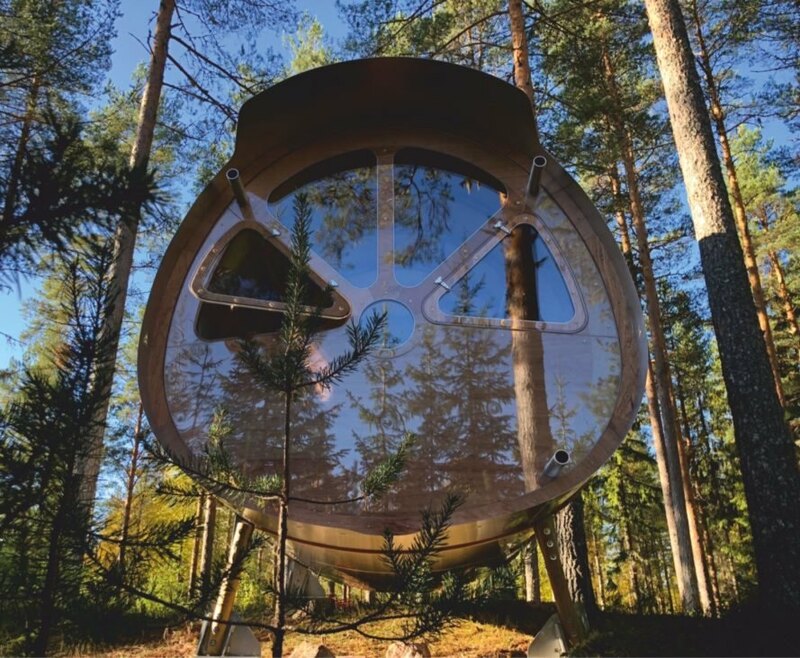 Tree Tents International has created this futuristic treehouse designed for "extreme wilderness" glamping. The Fuselage draws inspiration from modern aerospace design. The durable, lightweight structure can handle even the toughest terrains. 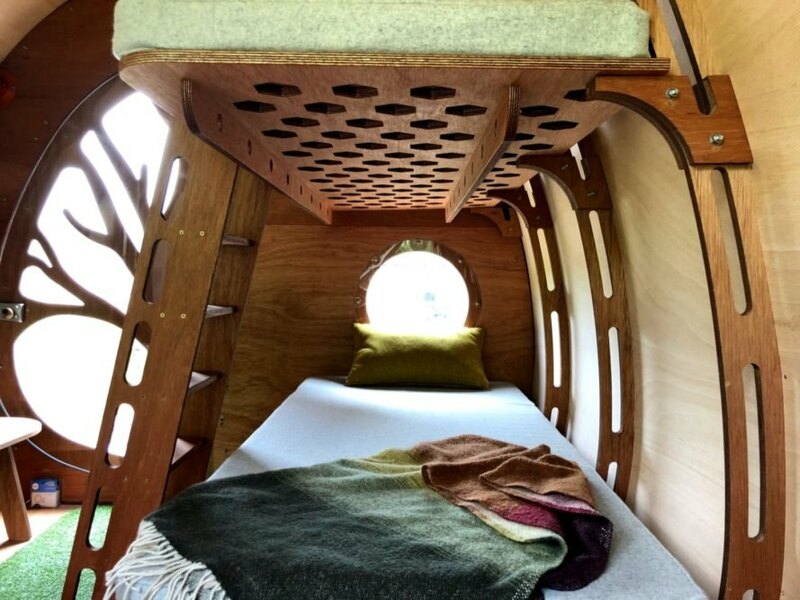 The treehouse is flat-packed for easy transportation. Modular components come together to form a timber and aluminum frame. A closer look at the frame. The treehouse requires no heavy machinery for onsite assembly. A cozy interior keeps residents comfortable. Lifted into the treetops or on challenging cliffs, the Fuselage will offer unmatched views of pristine surroundings. Each unit is equipped with furnishings. Orders can also be upgraded with custom features. Prices start at £26,000 (about $33,672 USD).